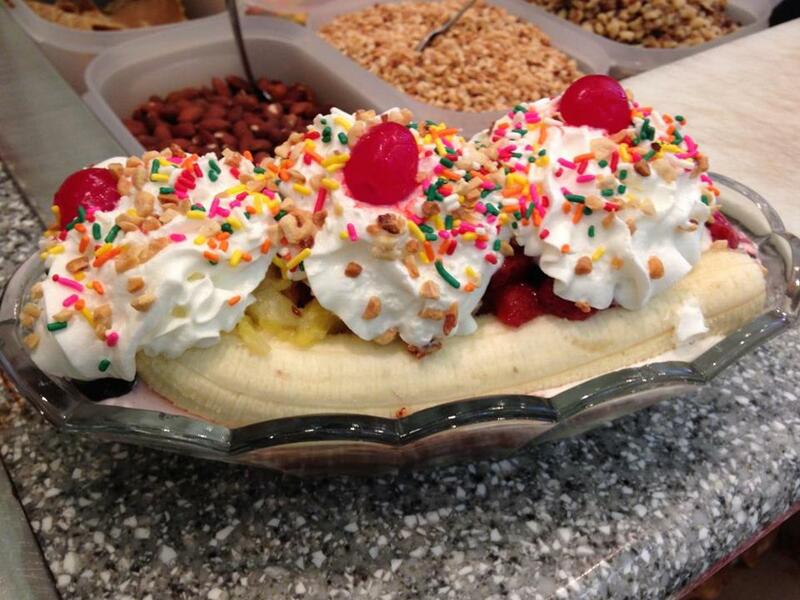 A large banana split at Lizzy’s Homemade Ice Cream starts with the basics, and then customers can pile on the toppings. Founder Nick Pappas likes letting people choose their own flavors and toppings — although he strongly recommends a scoop of vanilla, chocolate, and strawberry, covered in hot fudge, caramel, strawberries, whipped cream, cherries, sprinkles, and nuts. Pineapple is also very popular. The hot fudge and all the ice creams are made at the store. The large banana split costs $10.06. www.lizzysicecream.com. Uhlman’s creamy vanilla ice cream is spun with ribbons of salted caramel and loaded with chunks of chocolate-dipped pretzels. It comes in four sizes, ranging from baby ($2.25) to large ($5.25). www.uhlmansicecream.com. A new flavor this year combines black raspberry ice cream with chunks of Oreo cookies. It’s served in cups or cones in four sizes ranging from kiddie ($2.56) to large ($4.76). You can get a waffle cone for another 86 cents. www.nonasicecream.com. Farfar’s signature flavor has extra helpings of heavy cream that makes this ice cream a perfect complement to fresh fruit in the summer, and on top of apple or pumpkin pie in the fall and winter. It costs $6 per pint, $10 per quart; and cones range from kiddie size ($3) to large ($5.55). www.farfarsicecream.com. This sundae features ice cream made with local raspberries, topped with whipped cream, nuts, a cherry, and fresh native red raspberry sauce, made on location. $10 for the regular size, and $9 for a junior helping. www.bensonsicecream.com. Seven flavors in seven scoops, picked by the customer, are covered with a homemade brownie, a banana, whipped cream, nuts, cherries, and four other toppings of the customer’s choosing make up this behemoth, which is served in a large bowl. $25. 978-465-8515. Nick Kapteyn can be reached at nicholas.kapteyn@ globe.com.